Blender fractured it that’s what! 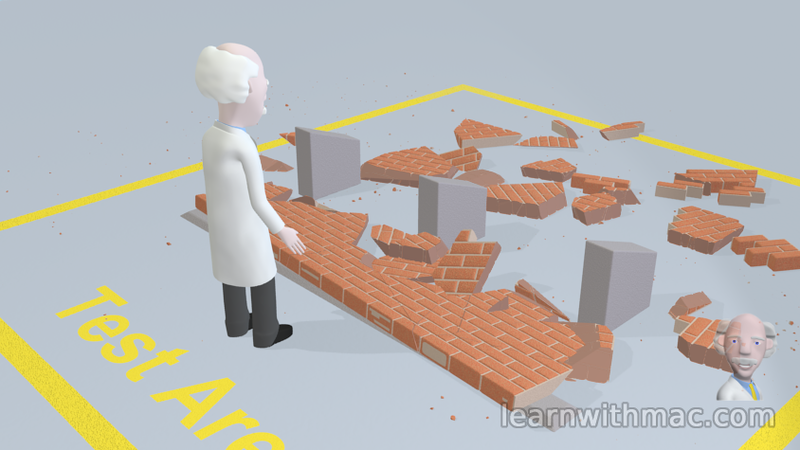 I have been modelling the fracture of a wall for my video explaining the concept of force. For this particular video shot I wanted to demonstrate that if you apply a force to an unstable wall it will fall over once the force exceeds the foundation strength. The result is dramatic, with the wall fracturing into pieces as it hits strategically placed obstacles. I knew that Blender had a physics engine but had never used it for my animations, which is rather ironic since my videos are all about physics! After looking around YouTube for some guidance on the physics engine I had sufficient knowledge to start the modelling process of the wall fracture. Blender has a wide variety of add-on modules which the community develops to provide additional capability. One of these is an add-on called Cell Fracture. This fractures an object into pieces using an algorithm controlled by a number of user specified options. You can have these fractured elements controlled by the physics engine as the wall falls over. The result is a wall of many parts realistically scattered around the laboratory floor. If you look closely at the image you will also see small fragments of the wall scattered around the floor. I generated these using a feature of Blender which enables you to generate particles which are also controlled by the physics engine. This gives the effect of an explosion of wall fragments as the fracture takes place in the main structure of the wall. In the video you will also see a large cloud of dust as the wall fractures. This is generated using the Blender smoke simulation giving a nice final polish to the sequence. I am now working on the sound effect of the wall impact and a slow motion sequence as the fractured elements fly through the air before coming to rest on the laboratory floor. Previous story What to do with this wall?